Over the last 100 years, ethnic minority tribal groups have migrated to Northern Thailand to escape war, hardship and military dictatorship in neighbouring areas. 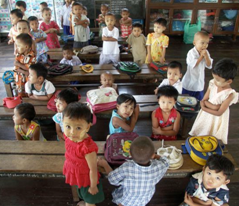 The current population is estimated at over 550,000 in Thailand alone. 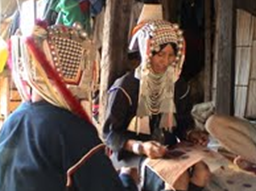 In general, the term “hilltribe” is comprised of six separate groups: Akha, Karen, Lahu, Mien, Lisu, and Hmong. All are originally from different regions, and all have their own individual cultures and traditions. None of their languages is from the same group as Thai. Burmese refugees and displaced people since the Burmese military government took power in 1962, millions of people have fled the country. Among the most disadvantaged are ethnic minorities (notably Shan, Karen, and Mon) whose villages have been destroyed by the Burmese junta in areas along the border. In addition, huge numbers of ethnic Burmese people live and work in Thailand as undocumented workers. They fail to receive access to basic necessities such as health care, education and fair labor practices. 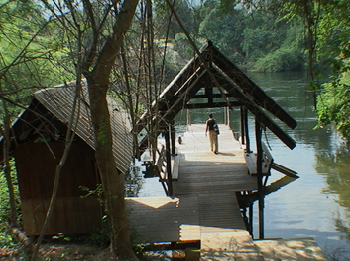 Founded in 1979, Moo Baan Dek, or Children’s Village School and shelter is located on KwaeNoi River (the River Kwai) serving 150 children from ages 3 – 18. 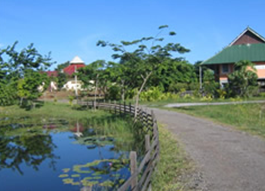 Moo Baan Dek (translated as Children’s Village) is an alternative living community. Through love, nature and freedom Moo Baan Dek strives to nourish the damaged souls of abused, orphaned and underprivileged children. Not only are our children offered free education, food and accommodation, but also they are taught to love themselves, their culture and the land on which they live. Our aim is to instill these children, often from the most difficult of backgrounds, with confidence and skills, which will allow them to be self-sufficient and positive members of society. Thus we hope to break the vicious circle of poverty in which these children are trapped. Majority of the children are from impoverished families, some are orphaned and others were former street children. Many of the teachers today were raised at Moo Baan Dek, knowing no other home. 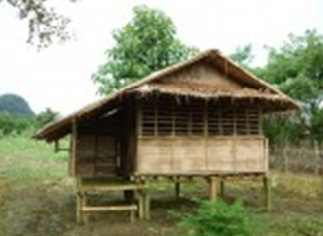 An important aspect of the Moo Baan Dek community is that of freedom and self government. With the freedom to govern their own lives, the children are prompted to think, problem solve, make choices, discover meaning in their lives and come to attain self-understanding. Donation to cover medical treatment, general day to day expenses. Moo Baan Dek does accept volunteers with strong leadership and most needed teachers with a vocational specialty. The kids of MBD send out a gigantic thank you to John and Nina Cassils! The plans have been drawn and the material is on its way. A sturdy dock, with a slide and ropes to swing on is a dream come true for these little monkeys here! Swimming at the river is an essential part of life at the Children’s Village for washing clothes, for bathing, for healing therapy and for just plain fun, the river is used numerous times a day by all. The current dock we have is a great illustration of the use it gets. The stairs are deadly, the dock itself is becoming one with the river and when 4pm bath time hits, the small dock is as crowded as the street markets in Bangkok! The plan for the new dock is similar to the dock we have, very simple and rustic. The only changes will be in size and sturdiness, and of course the fun stuff- a slide and some ropes. 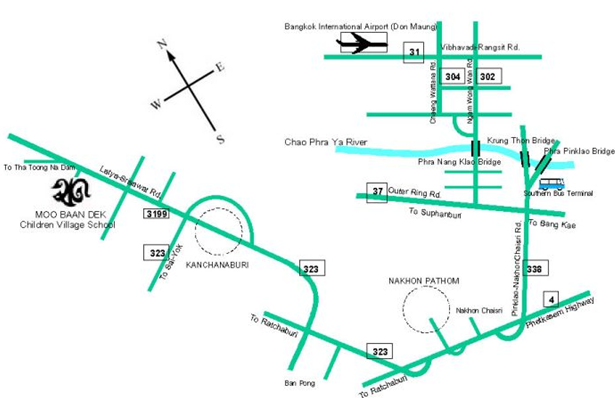 The project will be done by the carpentry staff and students at Moo Baan Dek. Made possible by our friends John and Nina Cassils from Vancouver, Canada, Moo Baan Dek will soon start construction on a greatly needed infirmary. With so many little ones jumping in and out of trees, running up and down and all around- an infirmary is a badly needed facility! It will be conveniently located beside the new Kindergarten and in the center of the children’s houses. We already have a substantial amount of supplies, brought from Canada by John and Nina to stock the infirmary with. What is Khom Loy doing to help the marginalized families of Northern Thailand? Khom Loy uses innovative and sustainable ways of empowering marginalized peoples to improve their own lives, giving them options to design the future for themselves and their children, as well as to improve their quality of life. All of our projects are based upon a model of participation combining knowledge, skills and abilities with the desire to solve problems that the participants themselves choose. 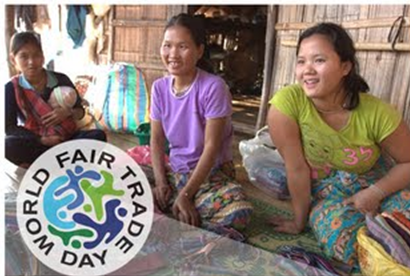 Working with Hill tribes, Burmese refugees and displaced people in communities based on the Burma/Thai borders to pursue their traditional agricultural lifestyles, leading to them becoming dependent on low-wage, seasonal labouring jobs at below minimum-wage. Khom Loy Development Foundation is currently working on projects in the fields of agriculture, income generation, education and handicrafts. For many of these groups, they cannot move out of their immediate area to seek work, nor receive education or healthcare. Others are at risk of deportation to Burma, where they may face political persecution. Through the use of small grants and skills trainings, these families receive the opportunity to pull themselves out of poverty without having to rely on external aid indefinitely. To date KLDF has helped families from over 30 villages with a variety of projects, including training, supplying seeds and plants, microcredit, and organizing land use for landless families. 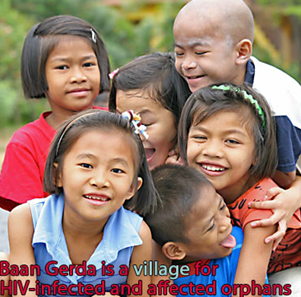 Baan Gerda is a children’s charity that provides homes and care for HIV infected and affected orphans. The small community is based in Lopburi province in Thailand. Unlike a state orphanage, Baan Gerda has a unique family environment with foster parents looking after the children and their daily needs. A medical team is on hand to ensure that they receive the best treatment and medicine. As better medicine became available, however, and as the organization gained more financial support from donors, it became possible for Baan Gerda to provide long-term care. Little did we imagine that one day we would admit children in an advanced stage of AIDS and that we would be able to nurse them back to health. 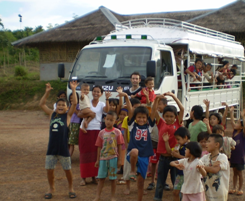 Baan Gerda is a children’s charity that provides homes and care for HIV infected and affected orphans. Baan Gerda has a unique operating model that provides family-style homes for orphans with foster parents looking after the children. All of the parents are HIV positive, thus ensuring they are sensitive to the needs of HIV infected children. It is the only one of its kind in Thailand. 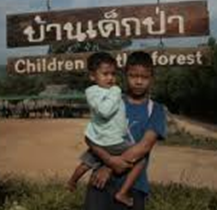 Children of the Forest is located in Sangkhlaburi, 19km from the Thai-Burma border, an area where today, stateless children face a life entrenched in poverty and danger. Children of the Forest is a project aimed at providing protection and assistance to stateless Karen and Mon children and mothers in most urgent need. We deliver services through school and shelter with outreach programs serving in the Shangkhlaburi district, home to a high percentage of marginalized children and single mothers , and stateless children. Work of Children of the Forest is focused on the critical issues of education, health care, and child protection striving to provide hope and opportunity to those most in need, and create paths to stability. The children came enthusiastically in great numbers. We had expected about fifty students to join our free school, yet one hundred and fifty arrived on the first day.